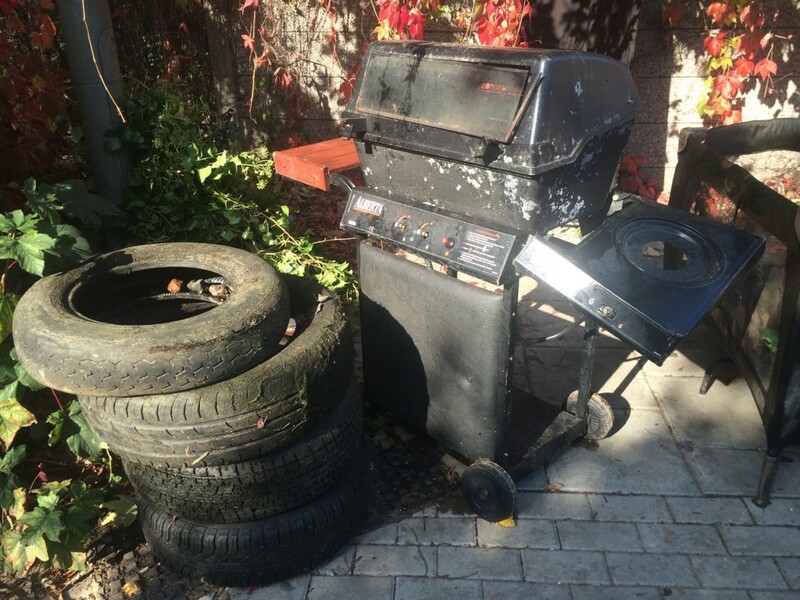 Our October cleanup this year was pretty special, but where to start?! 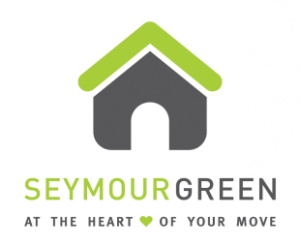 Seymour Green Estate Agents who were supporting the event joined us with their local team as well as South West London TV who had come to film our event and see what we get up to on the second Sunday of every month. 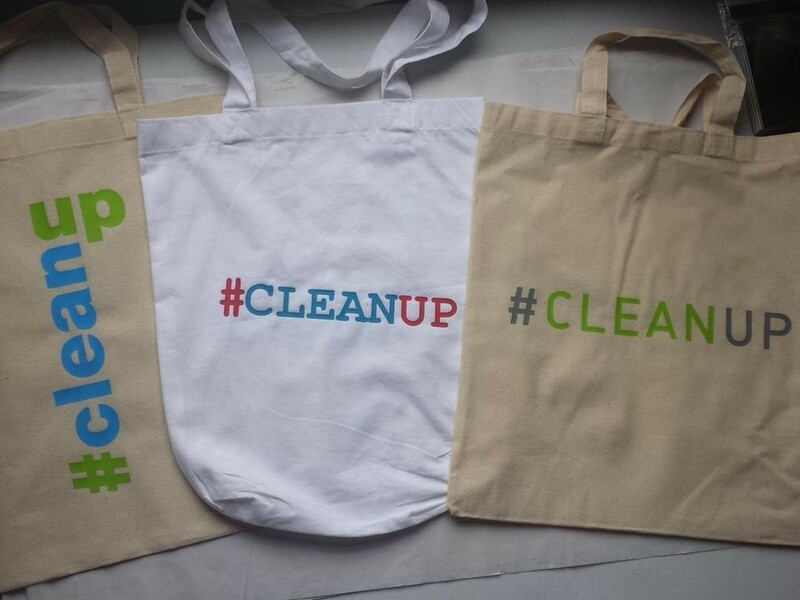 On top of this, we were joined by Mancinism Design who had made organic cotton bags and branded jumpers especially for the event. Mine was so comfy I wore it all day, and into the office on Monday! So even before we had started, it was already a special cleanup. To get the event started, I introduced the day’s plan which was to divide into two wading groups. One to head upstream in the hunt of motorbikes (a classic find at Trewint Street unfortunately) and one to head downstream for all sorts of other rubbish. Everyone else would support from the bank and litter pick on the Wandle Trail. 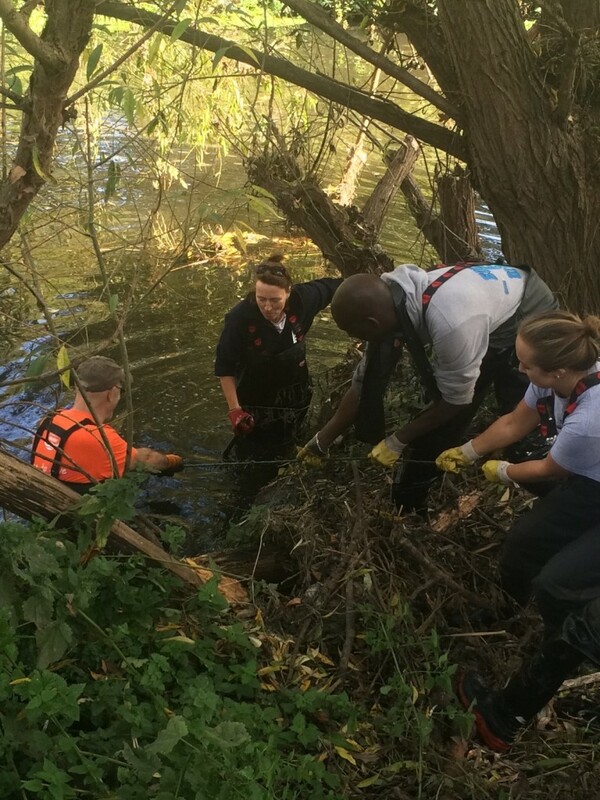 Pretty quickly, the wading team were finding plenty of rubbish in the river. However the added challenge of Trewint Street is that the trugs of rubbish have to be hauled up the concrete wall – not logistically easy. Our motorbike hunting team were off to a slow start, but just as we thought there weren’t any, we found two! The first came up relatively easy, being a small moped. But the second took 15 people on a rope to heave up. 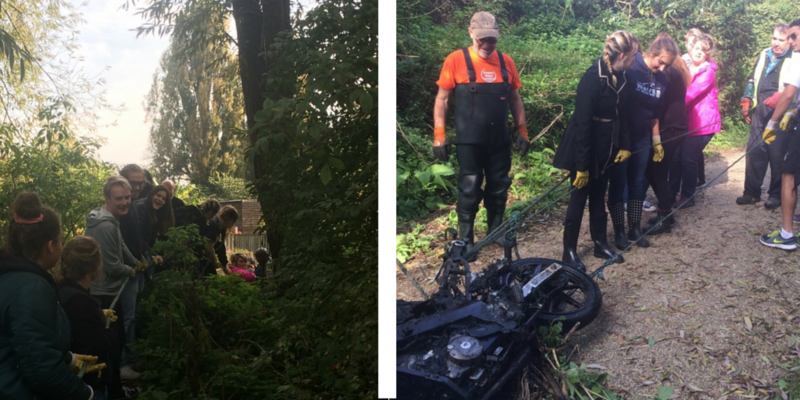 The students from Richmond International University all grabbed the ropes and dragged the bike all the way back to the rubbish pile – we were very glad they all came along! Downstream of the bridge, our wading team were finding some large items which they then had to drag back up the river (against the flow) for us to haul up. 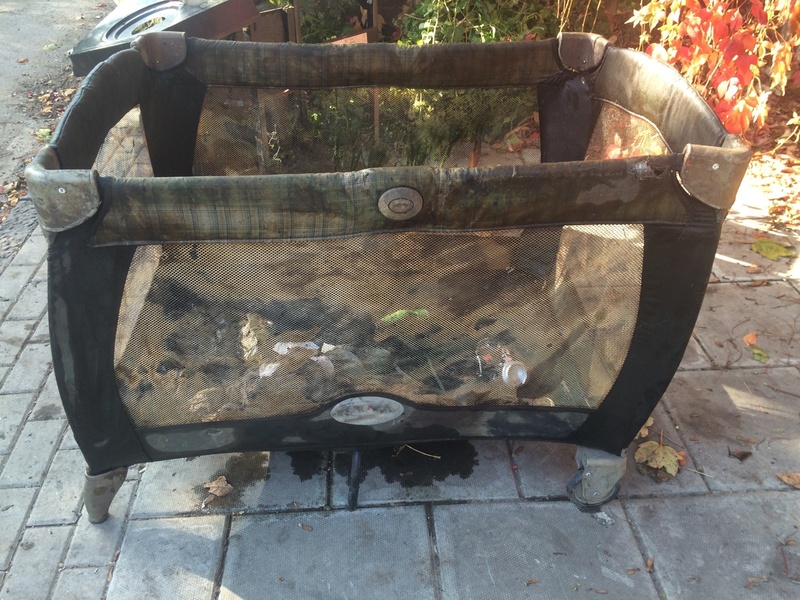 They found a toddler’s cot..
And a motorbike which was too heavy to bring back so we hauled it out onto the bank to be collected during our next cleanup downstream at Ravensbury Terrace. Meanwhile, cleanup guru Jane and Winston (Macinism Design) had found something lurking in the silt of the Wandle, but the identity of the mystery object remained unknown all morning as they struggled to move it on their own. Luckily after lunch we sent more helpers and the object was found to be an old fireplace. Speaking of lunch – what a treat! Ben’s Canteen supplied us all with bacon rolls! These quickly disappeared among the hungry volunteers. And Bean & Hop sent us some other snacks to share around. So a big thank you to them! After lunch, everyone was back in the river. 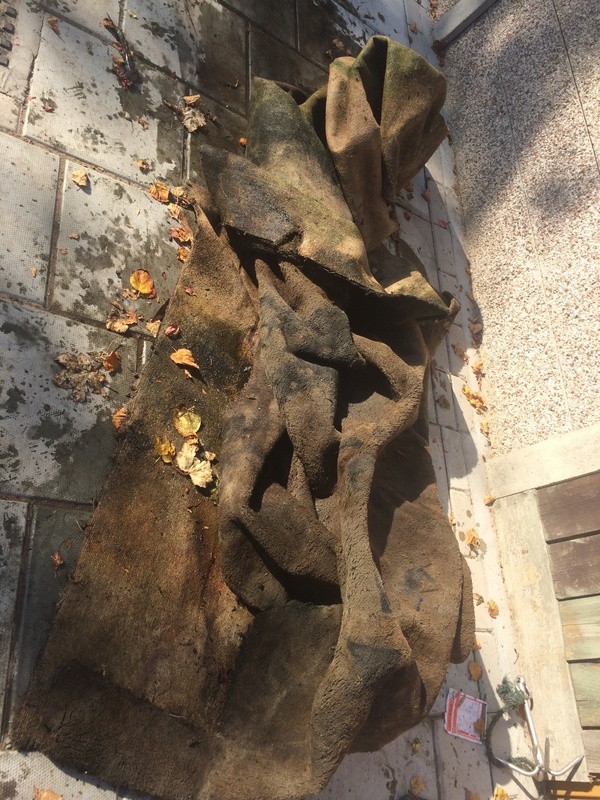 One of the last finds was a carpet – not an easy things to pull out of the river, let alone drag back up the channel, haul over the concrete wall and then ferry it to the rubbish pile. But it made it! So it was a hugely successful day! Thank you to all the volunteers who came along to our event, we hope to see you all at the next one on November 8th at Plough Lane! So what did we find? 1 fireplace, 1 radiator, 1 BBQ, 1 toddler playpen, 1 Woody doll (who had seen better days), 1 mattress wire, 1 strimmer, 1 vacuum cleaner, 1 number plate, 1 CD player (old school), 1 bicycle tyre, 1 Avengers Assemble football, 1 generic football, 1 bench, 1 carpet, 2 trolleys, 2 motorbikes, 4 tyres, several random pieces of metal and 40 bags of other rubbish. Huge thanks to everyone who helped pack up van after the event and Rose for supervising the Event Tent; Wally, Theo & Chris for helping supervise everyone on the day, Mancinism Design for our jumpers and bags, South West London TV for coming along and Ben’s Canteen for the bacon sandwiches and the Waste Management Team at Merton Council for organising collection of all the rubbish the next day. Thank you to all our volunteers for coming: Aaron, Abigail, Adam, Andrew W, Ann W, Brandi, Breuno, Brigid, Charles WS, Chris E, Chris R, Claire, Colin, Colin M, Curtis, Daniel, Dave J, Dave P, David W, Derek, Ed, Faisal, Geroid, Giacometi, Giulla, Hannah, Henry, Ida, Jack, Jane P, Jason, Jess, Jessica, Joanna, John N, Jonathan, Kimberly, Linus M, Lois, Louise, Luca, Maggie, Michael, Michael R, Nick, Nikola, Noah, Oliver, Olivia, Paul R, Penny, Phil, Rachel, Rob, Rose, Rosemary, Russell, Sally, Sara M, Sarah, Shannon, Simon, Tate, Theo, Tom, Vic, Wafiya, Wally, Wayne, William, Winston and Zoe. So what did I learn from this month’s cleanup? There is nothing better than a bacon sandwich after a morning of Wandle work. 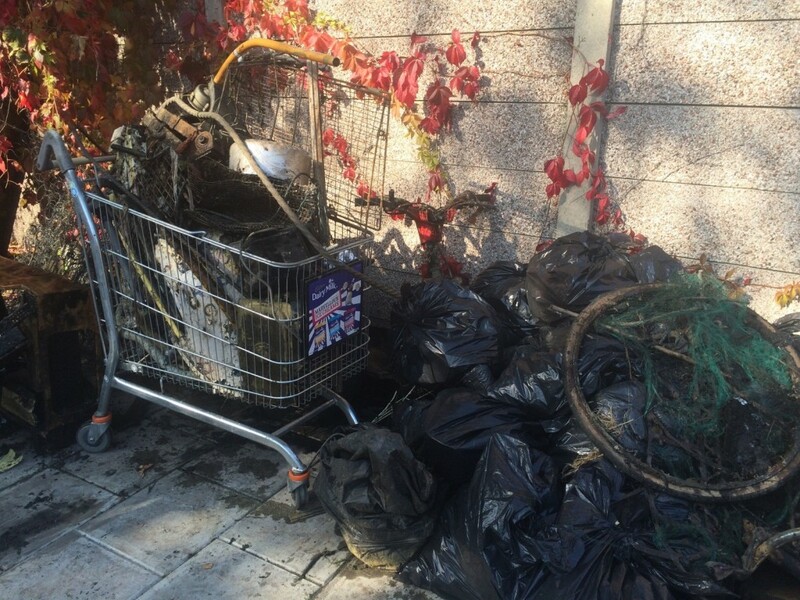 Check out South West London TV’s Video of the Cleanup here! 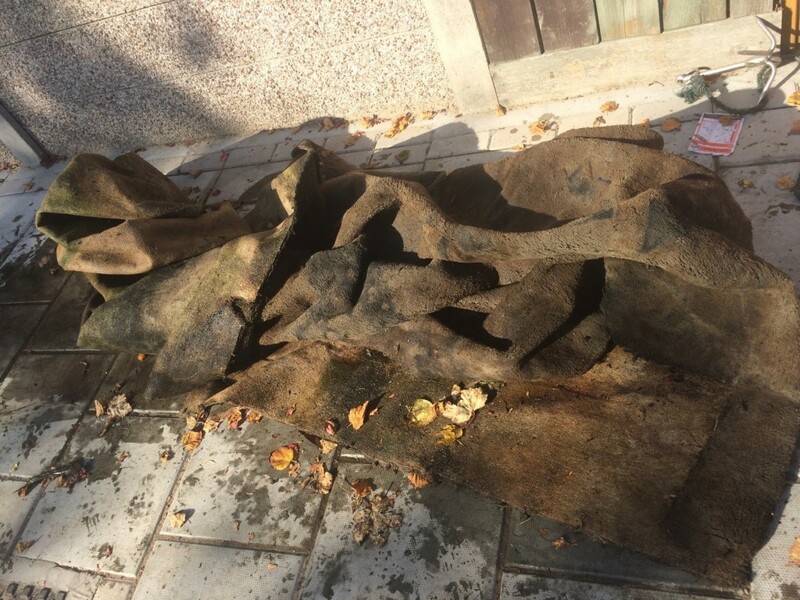 This entry was posted in Uncategorized and tagged Cleanups, Events, Living Wandle Landscape Partnership, People, Pollution, Seymour Green, Spreading the Wandle Word, Trewint Street, Volunteer, Wandle, Wandle Catchment Plan on October 20, 2015 by Polly.